AT FAPC, WE VALUE OUR CLIENTS AND WE AIM TO PROVIDE UNPARALLELED SERVICES FOR THEIR SUCCESS. FSS Accountinglink Professional Corporation (FAPC) aims to provide integrated accounting and tax solutions to individuals and small to medium-sized businesses. Using the state-of-the-art technology, the approach is personalized based on the current and future needs of the clients. FAPC’s objectives are to establish collaborations with business owners and computerized accounting system providers in creating effective financial and business processes to attain efficiency, reduce operating costs and sustain the financial growth of the clients. 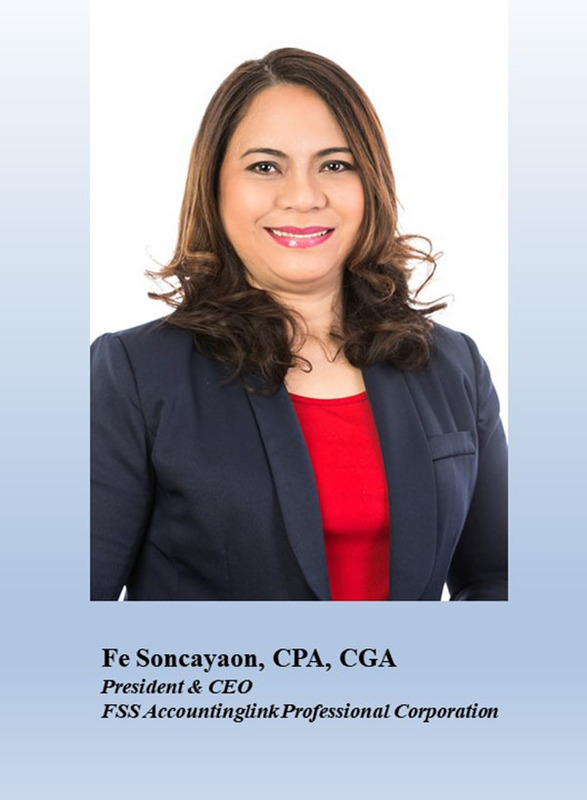 FAPC’s Founder, Fe Soncayaon is a highly experienced Chartered Professional Accountant in diverse industries such as retail, distribution, service, healthcare, property management/development, and manufacturing. With over 20 years of solid experience, the Founder established FAPC with the main objective of providing high quality accounting, bookkeeping, tax and other related services to maximize the benefits of the clients. FAPC provides holistic, proactive and simplified approach accounting services to ensure reliability of the financial statements which is crucial in making sound business decisions. In this way, clients can fully focus on their business operation and benefit from FAPC support to maximize their profits and minimize their costs. As a Certified QuickBooks Online ProAdvisor, FAPC offers bookkeeping services to small and medium-sized businesses using QuickBooks Online Accounting System. This system ensures your online access to your real-time financial records 24/7 from anywhere you want and backs up and secures your financial data. FAPC provides professional tax preparation services for employed and self-employed individuals and small to medium-sized corporations. We guide you towards compliance with tax rules and to maximize tax benefits. FAPC assists in evaluating payroll services that fit to your needs. Our services also include on-time filing of required reports and remittance of payroll source deductions. FAPC offers value added services that will help your business achieve its full potential. These services include set-up of Finance organization, business process improvement, creation of performance metrics, and assistance on system change management.